A video of Bonifacio Global City guards arresting two British nationals is now making its rounds in the social media sites. The vid had went viral due to the reported ‘inappropriate behavior’ shown by marshalls to the foreigners in a known high end city where big business establishments are located. As posted by YouTube account user ghelo bytes online, the one minute and 31 second shows an arrest of the foreigners that were unarmed and was pinned down by a bunch of guards. 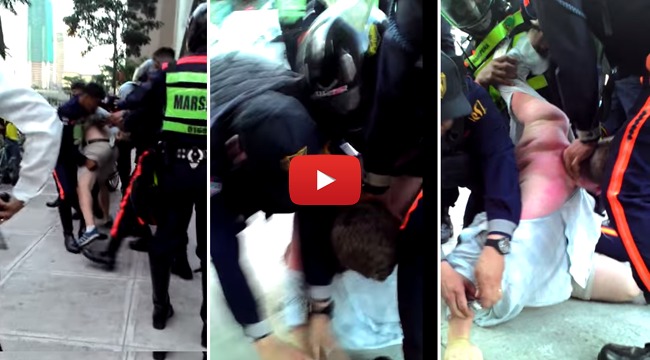 In the video, a British almost lost his shirt while guards are trying to put cuffs on him. It is audible that the apprehended is trying to be calm while asking the guards to go easy. Some people speculated that this shows inappropriate behavior from the guards. According to GriffinCorp, the story behind it was that the British nationals named Sam and Chris were expecting a fun afternoon last Saturday, September 27. While Sam is a resident of the city, Chris is having a vacation. While the best friends were playing their skateboard in late afternoon along the 5th Ave, two policewomen asked them to play in the park instead. Respecting the officers’ they moved to the park but after a while, a lady marshall came up to tell them to move to another spot. Thinking that it is okay to skate there since the police said earlier that it was so, they stood their ground and it started an argument. Backup was called, giving fright to the British men. They tried to grab their confiscated skateboard and ran off until they were caught at the corner of the 30th and and 5th ave by a group of guards. Post by Bonifacio Global City. While some netizens called foul about the manner of the arrest, BGC management Bonifacio Estate Services Corp released a statement admitting the guards inappropriate behavior while they stood their ground that the English men would be charged because of hurting a lady marshall. The video is so short and many had voiced out their concern that not all part of the story is seen.